From Middle English palme, from Old English palm, palma (“palm-tree, palm-branch”), from Latin palma (“palm-tree, palm-branch, palm of the hand”), from Proto-Indo-European *pl̥h₂meh₂, *plām- (“palm of the hand”). 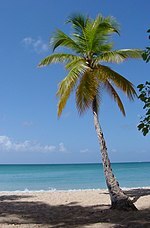 Cognate with Dutch palm, German Palme, Danish palme, Icelandic pálmur (“palm”). Any of various evergreen trees from the family Palmae or Arecaceae, which are mainly found in the tropics. A branch or leaf of the palm, anciently borne or worn as a symbol of victory or rejoicing. A great multitude […] stood before the throne, and before the Lamb, clothed with white robes, and palms in their hands. (figuratively, by extension) Triumph; victory. (Scouting) Any of 23 awards that can be earned after obtaining the Eagle Scout rank, but generally only before turning 18 years old. Terms derived from the noun "palm"
From Middle English palme, paume, from Old French palme, paulme, paume (“palm of the hand, ball, tennis”), from Latin palma (“palm of the hand, hand-breadth”), from Proto-Indo-European *palam-, *plām- (“palm of the hand”). Cognate with Ancient Greek παλάμη (palámē, “palm of the hand”), Old English folm (“palm of the hand”), Old Irish lám (“hand”). The inner and somewhat concave part of the human hand that extends from the wrist to the bases of the fingers. Clench'd her fingers till they bit the palm. The open palm of desire wants everything. The corresponding part of the forefoot of a lower mammal. A linear measure equal either to the breadth of the hand or to its length from the wrist to the ends of the fingers; a hand; used in measuring a horse's height. (sailmaking) A metallic disk attached to a strap and worn in the palm of the hand; used to push the needle through the canvas, in sewing sails, etc. The broad flattened part of an antler, as of a full-grown fallow deer; so called as resembling the palm of the hand with its protruding fingers. They watched until the younger bull received a second cut, this one on his flank from a point on the brow palm that would have impaled him if he hadn't jumped out of the way. (nautical) The flat inner face of an anchor fluke. To hold or conceal something in the palm of the hand, e.g, for an act of sleight of hand or to steal something. To hold something without bending the fingers significantly. To move something with the palm of the hand. The home side's goalkeeper Asmir Begovic managed to palm the drive on to the post but the sheer pace of the shot forced the ball into the net. From Old Swedish palmber, palma, from Old Norse palmi, from Latin palma.